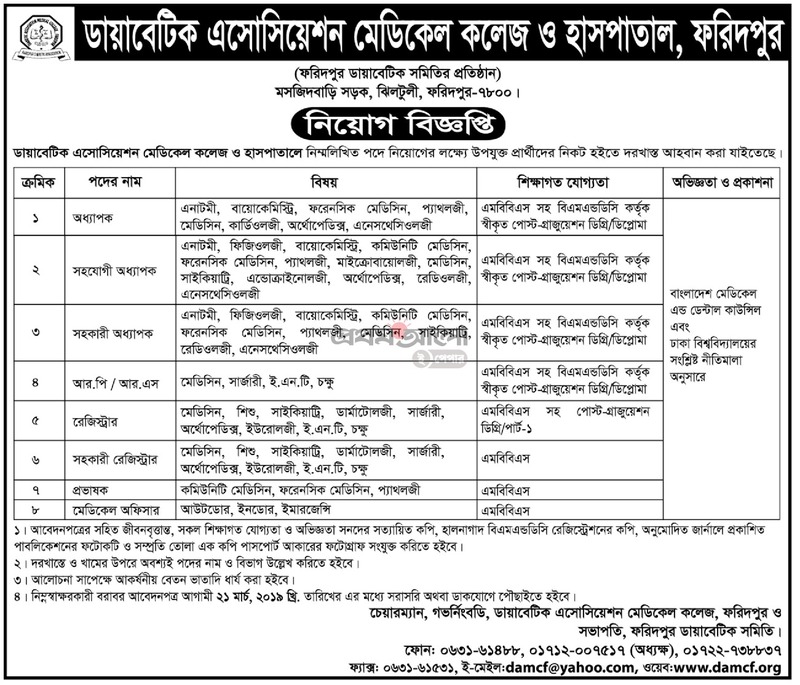 Jobs from Diabetic Association Medical College Hospital has been published..Hope you will get the truth and detailed news through us.Diabetic Association Medical College Hospital has circulated job circular in recent times.This is your chance to share your story and connect with job field in our country. As a hoping for a job, you’ll represent your skill and qualification. You can apply online or via email or directly through the post office. Diabetic Association Medical College Hospital authorities published the notice for jobs in their team. Our Lekhaporabd Jobs team has converted the notification into an image so that you can download and read later. Below is a short summary and you can see the full picture of the notification below. To download the image, click on the image to save image or give a screenshot. According to Diabetic Association Medical College Hospital, Since its establishment in the year 2009, Diabetic Association Medical College, Faridpur has come a long way in last the years and achieved great reputation amongst the non-government medical colleges in the country. We have adequate qualified teaching staff and modern teaching aids like computers, multimedia and overhead projectors for effective delivery of lectures. This medical college has a full-fledged library with sufficient text and reference books and journals. The library has high speed internet facilities with HINARI access. Our vision is to lead this institution into a Centre of Excellence for medical education, training and service.